Come see the Gyronaut LIVE! The Gyronaut team is looking for suitable events to exhibit this remarkable machine and its anticipated world-class restoration. Come on out to the strip to meet and greet Rob Ida, Sean and Mike Tucker and their crew. They'll have the work-in-progress Gyronaut there along with some other outstanding machinery including the "Lower '48", the "Roaster" '33 Willys, and a few other amazing builds from Rob Ida Concepts. En-route to complete its restoration, the Gyronaut will stop in at the annual convention of the Tucker Automobile Club. With a great dinner and special presentations including one by Tucker designer Alex Tremulis' nephew, Steve Tremulis, the evening promises to be inspirational. Also meet up with the Tucker family and Rob Ida and crew, as well as meet Bob Leppan, rider of the Gyronaut and the fastest man on two wheels from 1966 to 1970. Returning to Speed Week for the first time since 1970, the Gyronaut comes home to where it all began 50 years ago! Come visit original rider Bob Leppan, body restorer Rob Ida, see the Gyronaut's push-start vehicle: a 1948 Tucker, and meet up with Preston Tucker's great-grandsons Sean and Mike Tucker for a blast from the past!!! 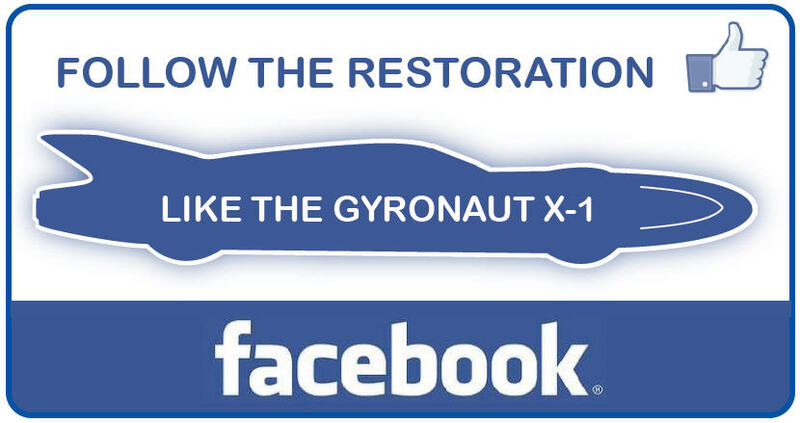 Once again, only now fully restored, come see the miraculous restoration of the Gyronaut in the MidAmerica Auctions Tent at the entrance to the field. A huge thanks to Ron Christenson for finding the space, not only for the Gyronaut, but for the 1948 Tucker tow-start vehicle from Speed Week! Join us in the Triumph display along with the Castrol Rocket, and check out some of the finest motorcycles in the world at the Barber Vintage Motorcycle Museum. Bring a gift and make Christmas special for some great kids and meet Rob Ida and his crew with the Gyronaut. At Wayne's Speed Shop, 1938 Route 35 North, South Amboy, NJ. Come on out and see the Gyronaut, the Castrol Rocket, the Lowbrow Customs "Double Vision, and a host of other great Triumph customs at the Progressive IMS in New York. A special display of Bonneville Salt Flat racing bikes will be sure to impress any fan of speed on two wheels. It all takes place in the triumph Motorcycles booth! Part of a very special exhibit, Bonneville: A Century of Speed Exhibit, the Gyronaut takes its place among many of the legends that set speed records in beautiful style. And it all benefits Save The Salt, a group of dedicated volunteers focused on preserving the natural resources of the Bonneville Salt Flats. Triumph welcomes journalists from around the world for the introduction of several new exciting models and the Gyronaut and Castrol Rocket serve as the backdrop for this media extravaganza. Now in its 26th year, at the Santa Clara County Fairgrounds. A great show of the best motorcycles west of the Mississippi. A great swap meet, too! ﻿The first Sunday of each month brings cars from all over to share their stories. Join us in the parking lot to see the cars and hear the stories and drink plenty of coffee. From 8:00 to 10:00am. Museum opens at 9:00am. Amongst the motorcycles, the event featur﻿es a gourmet barbeque lunch with offerings from local wineries and breweries, together with live entertainment, leading motorcycle manufacturers, lifestyle vendors and more - the perfect opportunity to spend a day amongst the finer things in life. Invite-only event featuring a Who's Who of motorcycle flat track Hall of Famers plus the current World's Fastest Motorcycle, the Ack Attack at 376.363mph. The Gyronaut brings the message of teamwork and perseverance to over 400 elementary school students who learn what it takes to create the World's Fastest Motorcycle. For 57 consecutive years, The Hillsborough Concours d’Elegance has built and maintained a proud tradition of honoring and celebrating excellence in automotive design and engineering. The passion of the Concours leadership and volunteers, pride of its entrants, and devotion of its attendees has earned Hillsborough the proud record as the longest continually running Concours in the world. This year features two of the marques to which Alex Tremulis applied his styling genius: The Cord to which he added the iconic exposed chrome exhausts, and the revolutionary Tucker Automobile on which he was responsible for the design and fabrication of the "Tin Goose" prototype and the final design features for the Tucker '48. It's only fitting to display the Gyronaut alongside his other creations!